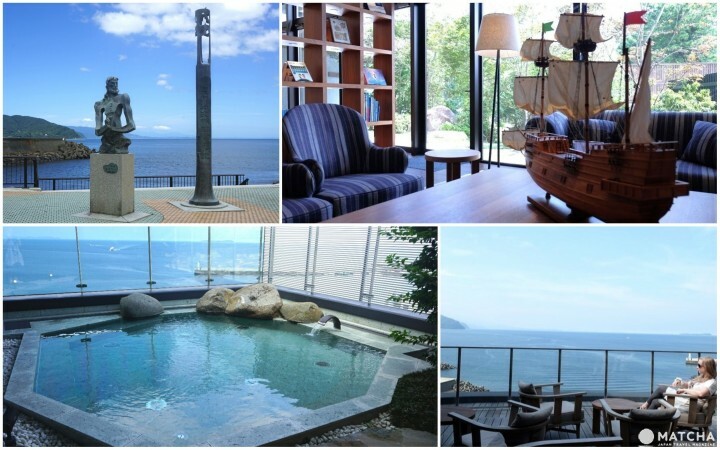 KAI Anjin is a luxury hot spring hotel run by Hoshino Resorts located in Ito, Shizuoka. Ito is a city well-known for its hot springs as well as for its beautiful beaches. The city also offers delicious local cuisine such as fresh horse macerel, mackerel, wasabi and mandarin oranges. A lesser known fact is that Ito played an important roll in early Edo period Japan and KAI Anjin is literally built on the grounds of this history. This article will introduce the charm of KAI Anjin from the perspective of a MATCHA writer who actually experienced it. KAI Anjin - Full of Exciting Ship-related Motifs! When you enter KAI Anjin you might immediately spot the many references to old Western-style ships all around the lobby. It is decorated with big and small ship models and ship-themed books. Even the wall beside the front desk is made of real wooden parts of old ships! Upon check-in, you will be given a KAI Anjin boarding pass just as if you would board a ship. It makes a nice keepsake of your stay at this ryokan. The reason for all the ship-inspired items in KAI Anjin is that it was built on the grounds where the first Western-style sailing ship in Japan was built in 1604. In this location, there used to be a large hole in the ground for ships to be built at a lower level and then flushed out into the sea. The name of the ryokan itself is taken from Miura Anjin, who built the first Western style sailing ships in Japan right here in this area. Miura Anjin, "The Blue-Eyed Samurai" - Get to Know His Story through Exciting Activities! Miura Anjin was an Englishman who originally traveled to the far east for trading. He was born under the name William Adams. Adams stranded in Japan in 1600 when the country was not open for trade. However, the future shogun Tokugawa Ieyasu took a liking to his intelligence and knowledge. In 1604, Ieyasu ordered Adams to build Western-style ships for Japan, which he did in exactly in the place where KAI Anjin stands today. Over the years, Adams became a trusted advisor and interpreter of Ieyasu and one of the first, and very few, persons from the West to become a samurai. His received the name Miura Anjin. The famous novel "Shogun" by James Clavell published in 1975 is based on the story of William Adams. To learn more, you can watch a short movie titled "The Blue-Eyed Samurai's Journey" in the lobby of KAI Anjin, which tells the story of William Adams' arrival and life in Japan. After watching the 15 minute long movie, guests can also join an interactive game called "Sailing to Edo" in which you get to help Adams figure out how to safely arrive in Edo with his ship. The staff will give explanations in Japanese and provide English language pamphlets explaining every step. It is a really fun game that will provide you with some interesting historical insights. Please check KAI Anjin's official website for more information. At KAI Anjin, Every Room Has an Ocean View! Every room at KAI Ryokan Anjin has an ocean view. You can sit comfortably on the couch and gaze through the large window at the bay where boats are coming and going. In every room there are ship-inspired objects, as well as interior design items that are specific to Japanese traditional houses. The guests can enjoy a charming marine antique atmosphere. In your room, you will find beautiful furoshiki (traditional Japanese wrapping cloths) with an instruction on how to make a bag out of them in your room. The furoshiki is meant for you to carry your belongings around the premises. Guests are invited to take them home at the end of their visit as a souvenir. The hotel also provides comfortable flax yukata. Do wear them to enjoy the authentic ryokan experience. If you would like to learn more about the features of the rooms available at KAI Anjin, take a look at their official website. The Travel Library is designed after an old ship library with books on history, culture, crafts, and geography. You can listen to the relaxing sound of real records playing on the record player while reading one of the many books and drinking a cup of tea or coffee. In the Travel Library, you can mix your own tea with the herbs provided on this map. The jars have little flags sticking out of them so you can see where they originate from. The tea leaves come from the places where William Adams' ship stopped by during his travels. On the top floor, you can relax on the San Buena Deck, which is named after San Buena Ventura, the first ship built by Adams in Japan. After arriving at the ryokan or after enjoying hot spring bath, how about enjoying some time here on the deck? On the deck, guests can enjoy Indian pale ale, which has a high alcohol content and was used often during long travels by ship crews in the old days as it doesn't spoil easily. During the summer months, there was also a time-limited shaved ice dessert with black tea flavored topping which was also inspired by Adams' story. If you wish to learn more about these services, please check KAI Anjin's official website. 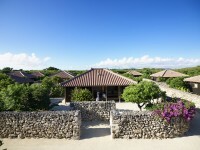 The hot spring facility includes separate baths for men and women and both consist of an indoor and an outdoor bath with a stunning view of the ocean. If you get up early to watch the sunrise, which you can see very well from your room or from the San Buena Deck, you can let the front desk know that you would like to join the "Ocean Stretch" on the rooftop. Breathing in the fresh morning air and performing simple guided exercises will help you start your day full of energy. Please note that this activity is only available in the summer. How about ordering a massage to refresh yourself? The massage therapist will come to your room and you can relax on your bed during the massage. A questionnaire is provided in English beforehand where you can choose your preferences and tell the massage therapist if you have particular issues you would like him or her to target or be aware of. Please check the official website of KAI Anjin for more information. At KAI Anjin the guests dine in semi-private rooms. Every room has a different design with walls made of colorful glass, structured paper, writing made from wire in glass or even real books. It is said that William Adams really liked to read, which is why books can be found all throughout the hotel. The breakfast and dinner are prepared with fresh local ingredients. Shizuoka is especially famous for their delicious fresh fish and seafood, so you will find plenty of them in your meal. At KAI Anjin, guests can enjoy Japanese kaiseki cuisine that takes inspiration from English cuisine. For example, one of the dishes is an alfonsino and clam soup cooked in the oven under a tofu skin crust. The ingredients and variations of the meals will change depending on the season. Please take a look at KAI Anjin's official website for details. Staying at KAI Anjin will give you an insight into the life of the man who became one of Japan's very few Western samurai and inspired the novel "Shogun". It is like a time travel while relaxing and enjoying Ito's great oceanside at the same time. So how about boarding the KAI Anjin to experience a part of Japan's fascinating history of trading with the West?